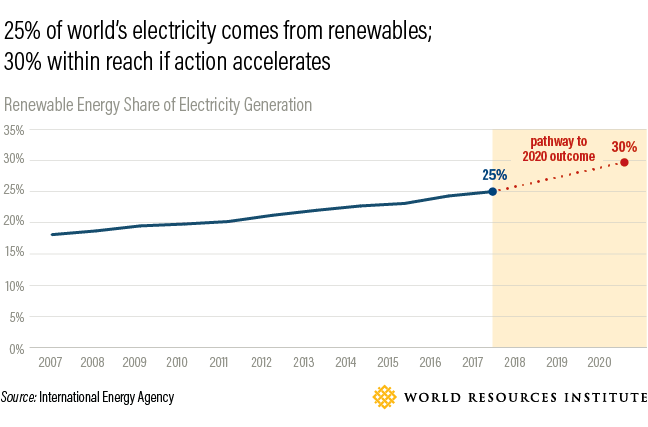 Increasing the share of electricity from renewables not only reduces GHG emissions, it also improves health outcomes and provides job opportunities. According to Mission 2020, in the next two years renewables should supply at least 30 percent of all electricity, existing coal-fired power plants should be going offline and no new coal plants should be built. In 2017, renewable sources provided 25 percent of electricity generation and accounted for more than two-thirds of new electricity capacity. Estimates show that by 2020, electricity from renewables will be consistently cheaper than electricity from most fossil fuels, indicating a possible tipping point in the transition to low-carbon power. Reaching 30 percent by 2020 is tentatively within reach if current trends accelerate. While the world has made progress in slowing coal's growth, net coal capacity is still growing globally. While many developed countries have accelerated the rate of retirement for coal-fired power plants, some developing countries are still adding new ones. 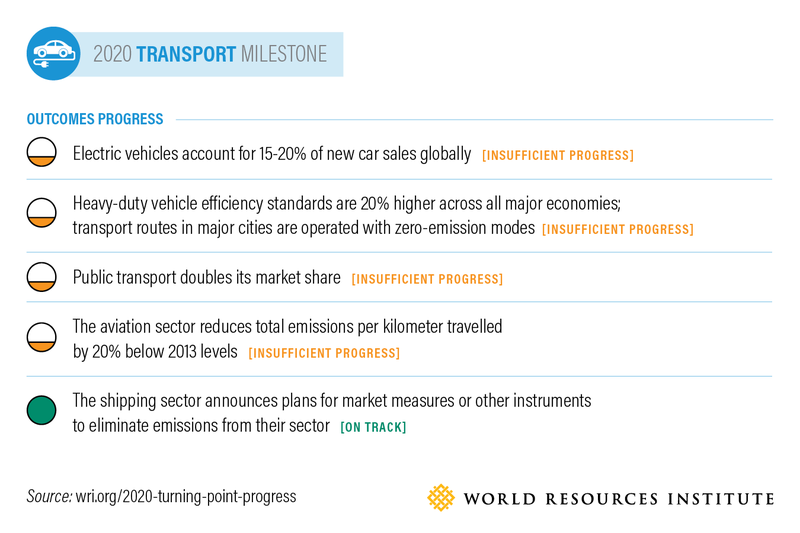 The Mission 2020 milestone for transportation is for zero-emissions transport to be the preferred form of all new mobility in the world's major cities and transport routes by 2020. This means electric vehicles should account for 15-20 percent of new car sales; efficiency standards for buses and trucks should be 20 percent higher; current market share for public transport should double; aviation emissions should drop by 20 percent; and we should eliminate emissions from the shipping sector. Progress has been insufficient in many areas and the transport sector needs to accelerate. 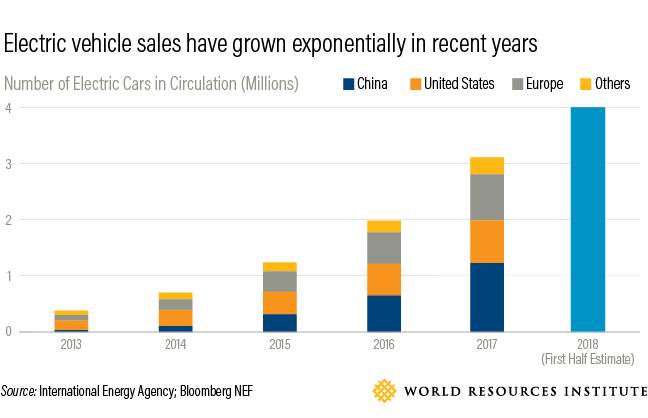 Electric vehicle sales have grown exponentially in recent years, driven by a strong policy push and technology innovations, but they still add up to only 1.4 percent of overall vehicle sales. Increasingly, buses and trucks are going electric as well, but more regions need to adopt fuel economy and emissions standards that cover these vehicles. Currently such standards only apply to 50 percent of heavy duty vehicle sales. In Africa, 27 percent of trips occur on public transportation, but cities should expand shared transport to meet growing demand. In North America, only 7 percent of all trips happen on public transport, so cities should adopt policies that encourage people to reduce private car use. Air travel is becoming more efficient, but the industry is not on track achieve a 20 percent emissions reduction by 2020. Meanwhile, there has been progress in the shipping industry, with the International Maritime Organization adopting its first strategy to reduce emissions in line with the Paris Agreement, and Maersk, the world's biggest shipping company, committing to be carbon-neutral by 2050. In order to preserve the many environmental, social and climate benefits that forests provide, Mission 2020 calls for ending net deforestation by 2020. 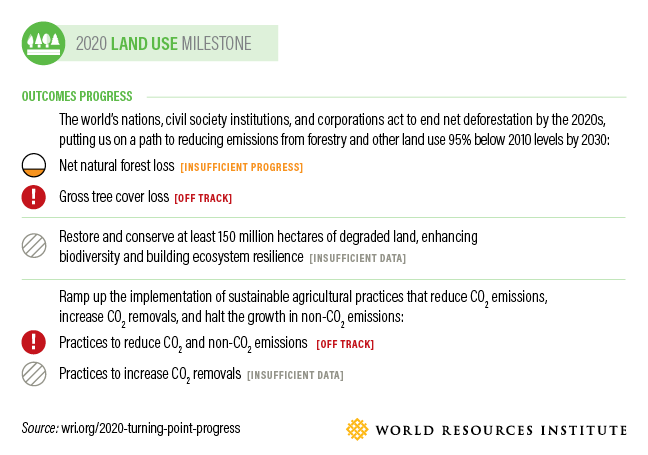 At the same time, forest managers, farmers and agribusinesses should restore at least 150 million hectares of deforested or degraded land, reduce pressure to clear additional forest, and implement agricultural practices that remove CO2 from the atmosphere rather than add to it. 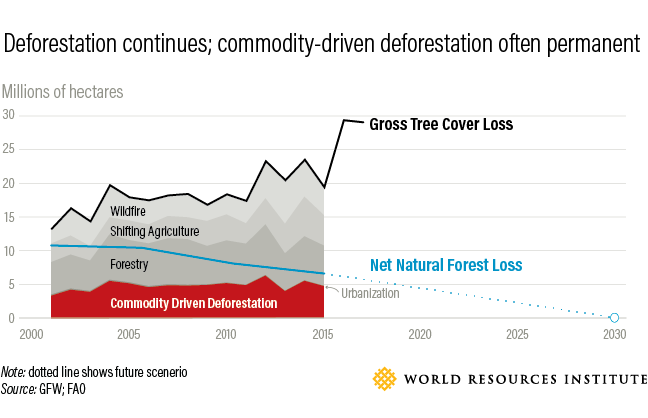 Yet gross tree cover loss has increased in recent years, and new data showing the locations and causes of this loss can help governments and corporations better monitor and target efforts to halt it. Tropical countries need to enact policies to step up forest protections and the corporations that operate in them need to follow through on existing commitments to limit deforestation in their supply chains. Forest restoration efforts are progressing in many countries, but hard to measure, while emissions from agriculture are still increasing – from 4.6 Gt of greenhouse gases in 2000 to 5.3 in 2016. Heavy industries like chemicals, steel and cement are collectively responsible for around a quarter of global CO2 emissions. 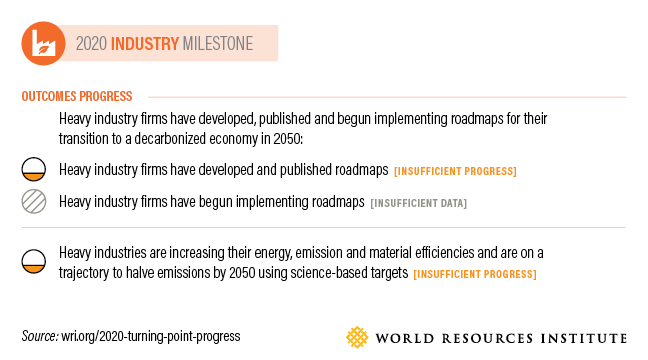 The Mission 2020 industry milestone is for companies to develop and begin implementing roadmaps that would halve their emissions over the next 30 years. Recent analysis found these industries could even reach zero emissions by 2050, at a cost of less than 0.5 percent of global GDP. 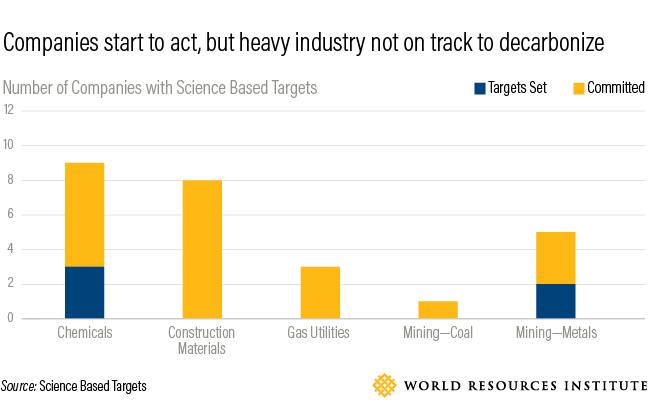 A number of companies have started to take action, including the 26 in the chart above that have set or committed to set science-based targets for emissions reductions. However, most companies' commitments are not transparent enough to give a clear picture of whether heavy industry is on track to decarbonize. 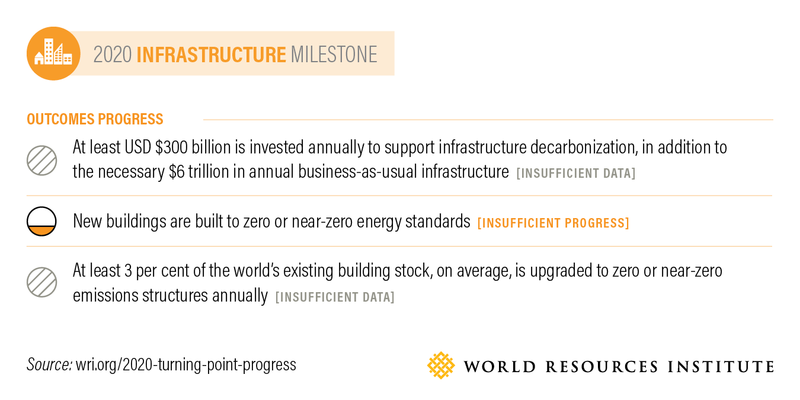 Mission 2020 calls for governments and investors to spend at least $300 billion annually on climate-friendly infrastructure, in addition to the $6 trillion necessary for business-as-usual infrastructure costs. New buildings should be built to zero-energy standards, and at least 3 percent of existing buildings should be upgraded to those standards each year. 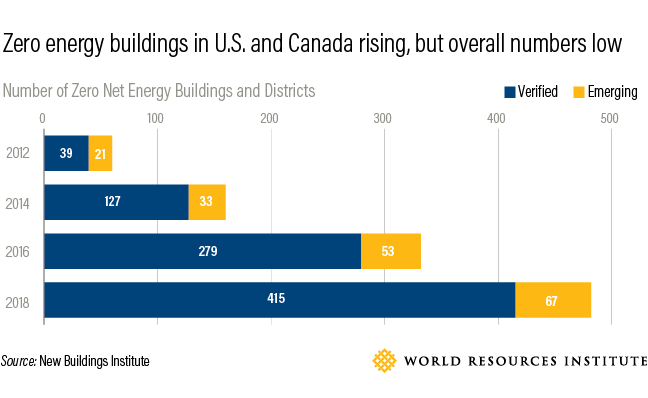 The number of zero energy buildings in cities has grown exponentially: 700 percent more since 2012 in North America alone. However, high-efficiency buildings account for less than 5 percent of construction in most markets today, and well less than 1 percent of the global building stock. We don't have sufficient data on upgrades for existing buildings, or for the state of infrastructure investment overall. The finance sector plays a critical role in directing the investments that will make all of the other Mission 2020 milestones possible. According to the campaign, financiers should be investing at least $1 trillion into climate action each year. 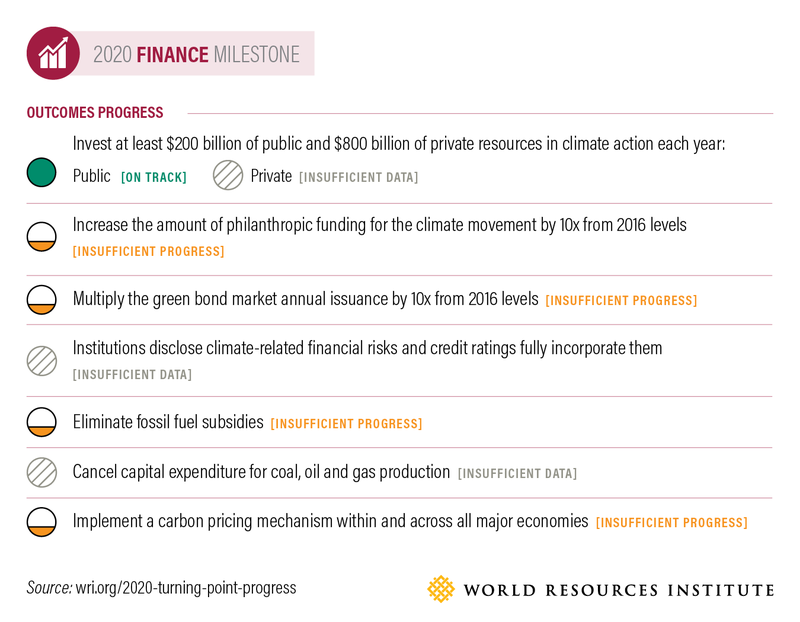 Important signals toward this milestone include a 10-fold increase in philanthropic funding for climate action and in green bonds; taking climate-related financial risks fully into account; eliminating fossil fuel subsidies; canceling capital expenditures for coal, oil and gas production; and implementing carbon pricing in all major economies. 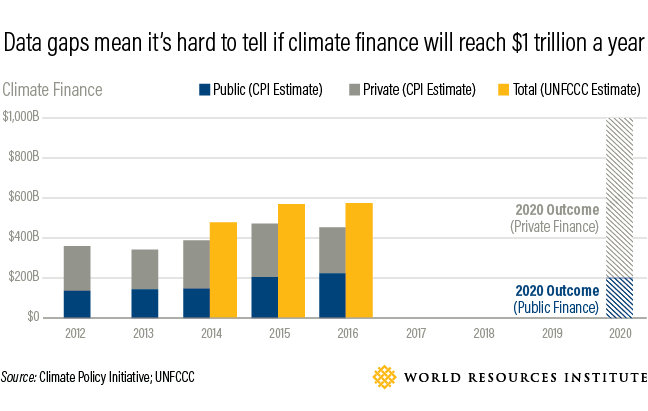 We've seen varying levels of progress in these areas—for example, the issuance of green bonds doubled between 2015-2016 and 2016-2017, then leveled off last year—but not yet at a pace that puts us on a path to limit warming to 1.5 degrees C.
Note: The estimates from CPI and the UNFCCC BA are calculated using different approaches, but neither captures the full landscape of climate finance flows. Investment to tackle climate change is estimated to have reached between $455 billion and $681 billion in 2016. These numbers only capture a portion of global financial flows due to lack of comprehensive data, so it's possible we are on track to spend $1 trillion per year on climate action by 2020. However, until more data is publicly available it is difficult gauge progress on this outcome.